The benefits of using social collaboration apps in the enterprise can outweigh the associated security risks if IT professionals strategically monitor and manage them. The use of unsanctioned social collaboration tools in the enterprise can be a real challenge for any IT organization, but they also often spark productivity and help teams focus. In fact, many CIOs and IT professionals say workers who use apps such as Yammer and Slack can both raise the threat associated with shadow IT and drive productivity gains. Companies must understand the unique strengths and weaknesses of popular social tools if they want to see real value, according to business leaders. Social collaboration apps compound the effects of shadow IT, according to Brian Kelley, CIO of Portage County, Ohio. When employees "go rogue" and veer away from traditional or sanctioned corporate communication tools, enterprises lose access to important records, he says. "Business leaders can reduce the risks and hidden dangers … of shadow IT by bringing it into the open," Kelley says. "This will require better aligning the business with IT, improving communication with managers, and reducing the complexity of IT procurement." "Shadow IT happens when users are not happy with existing solutions the company has put in place and are striving for process improvement and efficiency," says Doron Gordon, CEO of IT service management company Samanage. "The harder it is for teams to communicate effectively the more likely they are to seek out a resolution on their own." Different teams within a company often have different needs, but workers should not have complete freedom to pick and choose their own tools, according to Gordon. "Teams should be allowed to identify and solve problems on the ground," says J. Colin Peterson, CEO of J - I.T. Outsource, an IT support firm for small businesses. However, "[t]here should be consensus on the process and the tools that are used. Otherwise it is bedlam." In fact, Peterson says, IT professionals should insist that their staffs use approved tools. CIOs need to focus on workflows rather than adopt lenient technology policies to appease a minority of people on staff, according to Peterson. "My suggestion is to create a situation that makes it impossible to complete work without the approved apps," he says. "Figure out why you have people going rogue, determine if the benefit realized is real, implement where necessary, and disallow other applications." Mike Micucci, senior vice president of product management at Salesforce.com, says employees are most efficient when their collaboration tools connect directly to business processes or functions. "The end goal is to provide employees with access to a fully integrated suite that enhances relationships between colleagues and builds a more productive organization," he says. Collaboration tools should reach across departments, offices and regions, according to Micucci. "In my experience, the impact of a social network that unifies the whole organization always outweighs any specific feature preference by one group or another." Not everyone agrees that IT should be so strict about the social collaboration apps their staffs use. Marcus Schmidt, senior director of product management at enterprise tech firm West Unified Communications, says apps that enter the enterprise as shadow IT can morph into structured, managed solutions. Single applications with multiple sub-groups, channels or rooms for teams are always preferable, he says, because IT staff can manage employee access and view participation metrics in a single dashboard. "Ultimately, the key to success with social tools is to maximize adoption across the team. That is nearly impossible if there are multiple, competing shadow IT solutions." Once a collaboration app catches on with a dedicated set of employees, it can quickly spread to other members of the same line of business and result in different apps being used across the enterprise, according to Karim Sadroudine, director of innovation ecosystem at BroadSoft, a unified communications software maker. Unfortunately, it's a trend that's very difficult to contain, Sadroudine says. "I cannot think of an example where a mass movement for a tool or application in the enterprise was ever successfully controlled." Restrictions on corporate Internet access, and the use of personal email and popular apps such as Facebook are mostly futile attempts to prevent workers from using the tools they prefer, according to Mark Montini, chief results officer at marketing tech firm M2M Strategies. Businesses should endorse their preferred apps and attempt to drive adoption, but also encourage employees to leverage new tools that could prove to be valuable and eventually make it onto the preferred list, he says. "When businesses attempt to control social collaboration in the workplace, it serves to undermine the principles that drive social collaboration in the first place," he says. 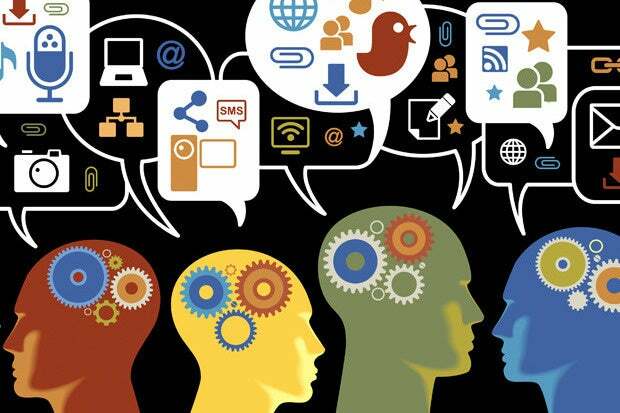 "The key is to contain, not control social collaboration. Social collaboration apps are increasingly pervasive in the enterprise, and they often boost the use of shadow IT, but that's not necessarily a bad thing, according to Andrew Horne, IT practice leader at CEB, a technology advisory firm, who calls the trend a "healthy development." "Often, the problem with collaboration isn't the tool itself but that the team isn't ready to collaborate," Horne says. As such, IT leaders need to prioritize their efforts around supporting collaboration, not forcing employees to use a specific tool.